The following information is from premierleague.com the official Premier League website. Paul Tierney and Chris Kavanagh are the first referees this season to whistle for a team twice. Not the obvious choices for this honour I think you will agree. Both have been in charge of just four games in six weeks. Paul is in charge of the Liverpool v Southampton game, he was in charge of the Leicester v Liverpool match in matchweek 4 on 1st September where Liverpool won by 2 – 1. Two matches in a month for Liverpool – hmmmmm. All Southampton Fans should be asking why. Chris is in charge of the Brighton v Tottenham match, he was also in charge of the Liverpool v Brighton match in Matchweek 3 on 25 August when Liverpool won by a single goal to nil. Brighton fans are also entitled to ask questions as to having the same referee twice within 3 weeks (excluding the International Break). Four new names for the season in the Fourth Official column with Roger East, Darren England, Gavin Ward and Mike Dean all being given a sign board and forced to listen to the Manager’s rants. Darren England is 33 and has 5 matches as referee in the championship, 1 in League 1 and 2 in League 2 as well as 5 cup matches this season and I suspect is being looked at for promotion to the Elite Group. Gavin Ward is 40 years old , he also has 5 Championship games and 1 League 1 matches this season as referee as well as one Carabao Cup match. Both referees are being allowed to experience Premier League matches ‘up close and personal’. Mike Dean needs no introduction either as fourth official or referee, the only surprise is that this is his first outing as fourth official. 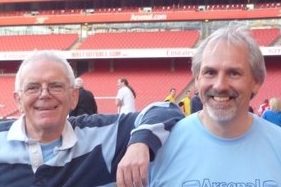 Roger East I will look at in my musings on the Arsenal officials at the end of the piece. Our match closes the Weekend events – kind scheduling as we then have to go again on Wednesday (although I suspect that there will be a bigger degree of rotation for that match than there was for Vorskla. Jonathan Moss was born in Sunderland but now lives in Yorkshire – his home County FA is the West Riding FA. (Yorkshire is the largest County in England and is subdivided into three parts called Ridings. They are the North, East and West Ridings, there is no unique name for the south of the County. I’m 50% Yorkshire so I thought I would throw that in that bit of trivia). He is 48 years old and has been a member of the Select Group since the start of the 2011/12 season. He was the referee in our 2015 Cup Final against Aston Villa. Historically our record with Moss in charge isn’t too bad, but he has never been given an Arsenal match against one of the other top six clubs – I’ll let you all draw your own conclusions from that, on first glance, statistic. More recent matches have seen Moss revert to the usual anti-Arsenal bias that pervades the entire refereeing fraternity under Mike Riley. Roger East, our Fourth Official, is a 53 year old referee. He was reported to have failed his pre-season fitness test due to illness. I would presume that he is now recovered and has passed the test. He is fourth official on Saturday for the Fulham match and again at the Emirates on Sunday. In my opinion 53 is too old to be an active referee at any senior level of football and he should consider if he really is fit enough to take charge of matches. Untold are bringing out the big-hitters for this match with both Walter and Carine coming over from Belgium so that should be sufficient to counterbalance any possible bias from the Officials. 11 comments to Matchweek 6 – All the games, All the officials. We have our first Repeat Referees. Save if the contrary does happen in the PL match between Cardiff City and Man City today regarding the match officiating, would referee Michael Olivier for being referee Michael Oliver that he is not help Man City to beat Cardiff City this afternoon in the match today in the PL in line with the Pgmo agenda of match result rigging in favour of their favoured club side, even if Cardiff City play very well in the match deserving to get at least a point in it? As for Jonathan Moss who is the centre referee in our home match against Everton in the PL tomorrow Sunday, and irrespective of the fact that has seen referee Jonathan Moss joined the bandwagon of the anti-Arsenal match referees in the PL at the Pgmo that’s intended to be defrauding Arsenal their legitimate game points collection in the PL. But notwithstanding this obnoxity against Arsenal, Arsenal has the antidote solution to nuetralise any anti-Arsenal match referring seemingly carried out against Arsenal in their match against Everton tomorrow and will negate to ground zero any anti-Arsenal match whistling and flagging in the game that could be directed against Arsenal by referee Jonathan Moss and any of his 2 match assistants. Jonathon Moss ranks 11th in the referee treatment league, having overseen 8 treatments so far this season. Everton is the most heavily cautioned team in the EPL, having played under caution for almost 500 man-minutes. Their players have needed treatments 17 times, and they have inflicted the need for treatment 9 times. Arsenal is middle of the pack at 337 man-minutes of caution (Wolves are lowest at 94, Liverpool!!! (155) and Chel$ea (180) are 2nd and 4th). Our players have needed treatment 9 times (1 for AMN broken bone) and the other team has needed treatment 6 times (twice self-inflicted). I think it likely that no Everton player will need treatment, and quite possible that an Arsenal player will require treatment. No card will be issued to an Everton player, should a treatment be needed. Heck, probably no foul will be issued either. Everton will likely get many cards, including quite early in the game. Arsenal will pick up at least one card, and it is nearly certain that Xhaka will get a card. The above link talks about an article I read about possible bias by EPL referees. Whether the person looked for bias in the correct way, I don’t know. The author certainly knew a thing or two about statistics. I think it is likely that what the analysis showed, is that betting statistics take into account referee bias. For some reason, the author felt that betting odds would not take referee bias into consideration. Both teams see less man-minutes of caution than average. Cardiff is near the top in terms of teams needing players requiring treatment, and Man$ity is above average in inflicting the need for treatment. Michael Oliver ranks 5th having overseen 11 treatments so far this season. I suspect that few cards will be brandished, but Man$ity will be allowed to kick Cardiff all over the park. If Cardiff start kicking, they will be carded. I think the first 2 (3?) matchdays this season, I was finding tallies of treatments, which typically were larger than mentions of treatments in commentary. And now if I revisit those early games, the tallies are gone. I suspect that PGMO and/or EPL insisted this data be removed from game coverage. In any event, in our first game AMN was fouled (and has been gone since then recovering from a broken bone in his leg), and I don’t think a foul was given there. Certainly no card was issued. Today, in the early game, Fulham’s Sessegon was off the field for 10 minutes for treatment, and I didn’t see a foul mentioned. There was no card on this incident. In Cardiff, just at the end of the half, Cardiff kicked Man$ity, and was carded for it. I see no other treatments mentioned. Oh, I believe that kick required a treatment in Cardiff. Meanwhile over in Liverpool!!! !, there has one treatment so far to each team. The treatment in Liverpool’s case, required an immediate substitution. No card for that incident. The fouls are about even at the moment (5:7), but the cards aren’t (0:2). Paul Tierney is the 14th ranked referee in the treatment league, only having overseen 4 treatments before today’s game. In the early game, it was nice to see Watford drop 2 points. In the games ending now, it was nice to see Bournemouth lose. Man$ity chalks up another win. Unfortunately, Leicester won. ManU currently tied in extra time? It would be nice to see that game as a draw, with both teams dropping 2 points. And Liverpool!!! did away with Southampton. And waiting for the final whistle, Wolves did dig out a draw with ManU. In the late game we have Brighton (261:12:-06) taking on the Tottenspud (251:05:-09). Magpie is Chris Kavanagh ranked 13th having overseen 3 treatments this year. I am hoping for Brighton to get the home win, but I suspect Kavanagh will let the Tottenspud kick Brighton all over the park, and the game could play to no cards, or maybe just one a piece. No cards will be issued for treatments. A loss or a tie to the Tottenspud could see us jump over them in the standing tomorrow, should we win. Chelsea (180:02:-03) is likely to beat State Aid (460:10:-09). Chelsea will probably get lots of assists from Mike Dean, currently ranked 7th in the referee treatment league having overseen 10 treatments. I would expect State Aid to get lots of cards tomorrow. With a bit of luck, we could be in 5th or 6th tomorrow. I hope that some of these new refs on the pgmo roster come from the SE the part of the country with the most clubs, registered players and practicing officials, the anti-southern England (Southern League?) bias is remarkable and plain old weird, but there it is! The article with the tackles table still had the desktop css, but the one newer than that, or choosing this matchweek 6 one; both came with the mobile CSS. Pressing the button to get the desktop CSS, still brings up the mobile CSS. State Aid (460:10:-09) vs Chel$ea (180:02:-03) has started. Mike Dean ranks 7th in the referee treatments league having overseen the need for 10 treatments. While State Aid has had players requiring treatments, and has inflicted treatment on opposition, Chel$ea has been the opposite. State Aid has also played more than 2.5 times as many man-minutes of caution than Chel$ea. I suspect that Mike Dean will hand out lots of cards to State Aid should they decide to come out kicking. And submit the comment, and the desktop CSS is back. Gremlins.